It’s become a nearly weekly tradition that we visit Buffalo Wild Wings on Tuesday. Why Tuesday? 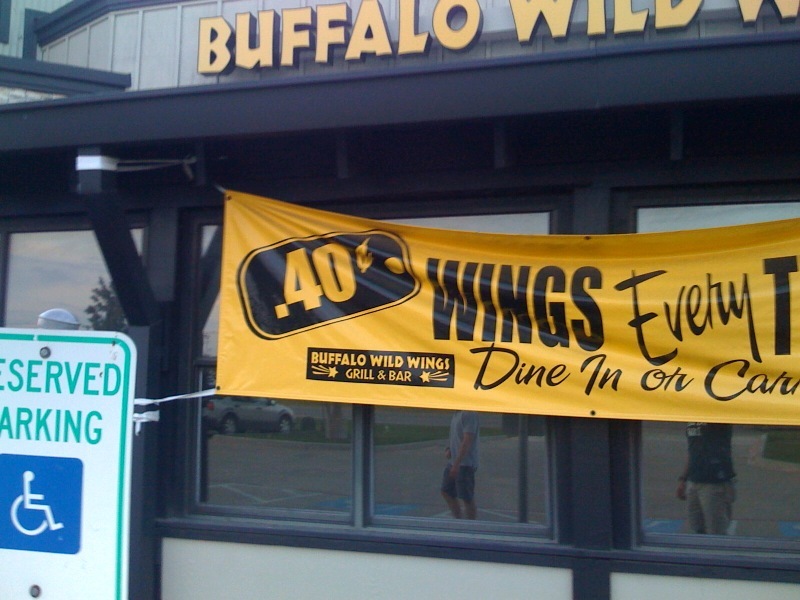 Every Tuesday at Buffalo Wild Wings is 40¢ Wing Tuesday. It’s not a bad deal at all. Apparently they used to be 25 cents, but hey, these are financially uncertain times. A couple of weeks ago, when heading inside, I noticed the banner below hanging outside the restaurant. Notice anything wrong? Notice the decimal point and the currency symbol. That’s a fortieth of a cent, not forty cents. How about that! You could eat 100 wings for 40 cents! That’s a fantastic deal! As a complete aside, have you ever heard Buffalo Wild Wings abbreviated as BW3’s? Why is that? UPDATE: Asked and answered. Thanks Justin! Wow, good eye on the fortieth of a cent mistake. You should try to make them honor it. I too have wondered why it’s called BW3’s. I didn’t even know Waco had one! The Waco location is on Franklin, across from the Super Wal-Mart and Chick-Fil-A. Good place to go on Tuesdays! 10 wings and wedges for under $8! Thanks for the enlightenment, Mr. Scott! I should have known that Wikipedia would have the answer.